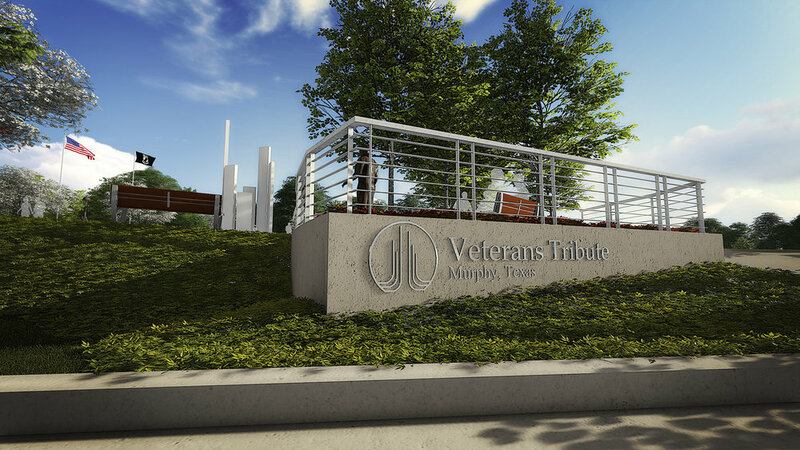 A final rendering of the Veterans Tribute Project was presented to the Murphy City Council on July 3, 2018. The Murphy Historical Society announced that this Tribute will honor all military veterans; past, present and future. The Murphy Veterans Tribute (MVT) has been in the planning stages since January 2017. According to Mary Pat Elledge, MVT Chairman, “We proceeded with the conception of this project after many months of research and various meetings, including the City of Murphy and Parks Department. A 100’ x 100’ tract near the entrance to Murphy Central Park was donated by the City of Murphy, and after that, our Committee was eager to move forward.” Elledge’s husband, Dwayne, is an Army Vietnam Veteran. A grant from the MCDC, & private funds, allowed the MVT to retain a landscape architect to create our design. “Halff Associates, a local architectural firm, designed the Tribute based on our 12+ months of extensive research.” said Lou Diamond, a Vietnam Veteran &Design Team Lead. “With the number of military veterans, 700 plus, living in Murphy and the surrounding area, we thought it was appropriate for us to recognize all veterans for what they’ve done for our country,” said Brian Epstein, Construction Liaison & Reserve Naval Officer. The Murphy Historical Society is seeking assistance in support of this project, whether it be monetary, materials or in-kind donations. They are a 501C3 organization so donations are tax deductible. Please see our website Murphyhistoricalsociety.org to find out more information, paypal account, & contact Tod Lyons 214-354-8617, Fundraising Chairman , for other ways you can help us make this MVT a reality for our City!